Daniel Bryan's return to the ring has been underwhelming so far. That's not through any fault of his own though as he's superb at everything the WWE throws at him. He certainly wasn't the reason why his feud with Big Cass didn't work, and he's definitely making the most of this weird tag-team feud with the Bludgeon Brothers. However, the Team Hell No reunion has the potential to change all of that and begin an upturn for post-return Bryan. So far the storyline has, for the most part, been a lot of fun. I know I certainly popped a little when Kane returned to help his former tag-team partner out against Harper and Rowan's attack. This has eventually led to a match between the two teams at Extreme Rules for the SmackDown Live Tag Team Titles. It's an intriguing match that will tell us a lot about WWE's plans for Bryan going forward. But, here are the five ways we think this tag-team bout could go down! The Bludgeon Brothers have been incredibly dominant as a tag-team but they've never faced anyone like the pairing of Daniel Bryan and Kane. 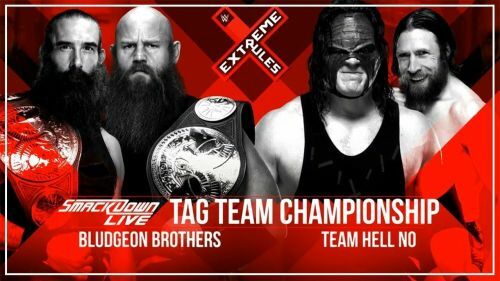 It's entirely possible that Team Hell No change their name to Team Hell Yes by claiming the SmackDown Live Tag-Team Titles and beating the Bludgeon Brothers clean. This would be a great way to make Bryan a champion in the WWE without burning out those hotly anticipated singles matches against the likes of Samoa Joe, AJ Styles and Shinsuke Nakamura. Plus it would allow Kane and Bryan to shine a spotlight on the SmackDown Live Tag-Team Division that has been consistently strong anyway. Plus we get intriguing matches like Team Hell No vs SAnitY, The Usos and The New Day. There’s plenty of time to get to those dream singles matches! WWE Rumors: Roman Reigns and Seth Rollins' Extreme Rules opponents leaked?